When I was young I thought eye color determined one’s color palate in life, and that blue was the province of blue-eyed people. It was just my little rule, and I lived by it. I believed that having hazel-brown eyes, I had to be content with “fall colors.” In my mind blue belonged to my younger sister. And I’m quite sure I was jealous of that. So when I became a mother I dressed my daughters in blue, regardless of their eye color. As much as they may have wanted to wear pink, I could see that they looked better in blue. I gave our blond first-born the whole array of blues, and I referred to each hue as “Ashley blue.” At one time, I am sure she was convinced it was her color. Dark-haired and fair- skinned, Jacqueline looked washed out in pastels but wore navy and reds splendidly. “Just like Snow White,” I’d say. I said it so often, I’m sure she thought she was Snow White. The girls submerged themselves in blues through their high school years. Ashley, in a complex Mediterranean blue room. Jacqueline, in a dark navy blue room encircled with framed posters of all her drama productions, and stars that illuminated on the ceiling in the dark. Clearly they had found themselves in blue. Meanwhile their mother trudged on in an earth color palatte of khakis, browns and greens–lots of beige– and dressed our home primarily in naturals. But if I had one indulgence color –wise, it was my blue & whites. A collection that grew over all those years and was always displayed prominently. A love affair of mine, if you will, with the color blue. The Talavere pottery pieces were carried back on my lap from various trips to Mexico. The Japanese Ginger Jar, an acquisition from an antique shop, way over my budget. Chinese Ginger jar “finds” in consignment shops, to help make up for that. The soup tureen, gifted by my mother when she and dad downsized into an apartment. 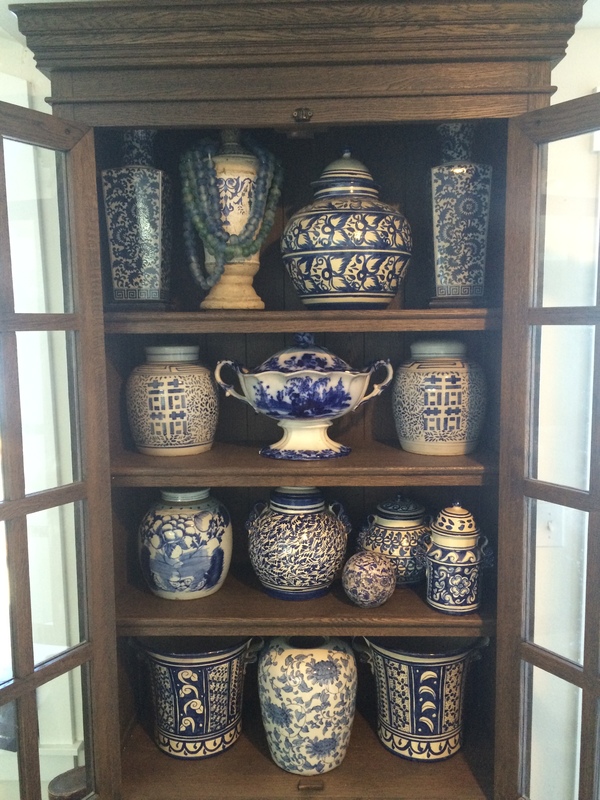 In every case, all the blues look splendid together, and this has been my revelation again and again, over the ages. I am allowing myself to indulge in blues now with this house by the sea. When the water isn’t green or gray it is blue blue blue. Our nights are often blue velvet skies. It’s true what they say, there’s a calming effect to blue. Some claim it can lower blood pressure and help relieve insomnia. I’m going for the tranquility of the color, and navy is my choice. Navy blue, I have found, is warm in the winter and works all summer long too. Insisting the home enhance the bay view, all the walls and woodwork were painted white. A whitewashed ceiling, hardwood floors, plenty of stone, oatmeal linen, and leather—all the naturals over the years. And where I can add color, I go out of my way now for navy. The darkness of navy is grounding, making light all the more brilliant. Likewise navy is “lifted” with brighter colors, particularly oranges, coral and reds. A wool rug in our foyer, navy with brown, olive green and orange, greets our guests (and hides cedar and pine needles from shoes and boots). An inky blue indigo ikat fabric drapes over a rail. An antique Turkish rug in the living room is navy with red, and beige. Navy blue cashmere throws are strewn on chairs, while navy blue Indian blanket pillows flank the distressed brown leather sofa. A solid navy blue linen duvet covers our bed. The master bath is navy and white. I wear more navy now in clothes, and everything is comfortable with navy in our home. And just as I had my blue & white collection going when little else in my life was blue, wouldn’t you know it, when I registered for gifts as a bride—if ever there were a time of indulgence, that is it—I chose white china with a wide navy blue rim. I look at them now and think, these plates knew where they were going all along. Guys can’t get away from blue, after all it is our pink… Good thing I like it?